The Clown Loach is a popular fish in tropical aquariums since it is very beautiful and not too difficult to keep. Its scientific name is Botia macracanthus and it is therefore also known as Botia fish. When you buy a loach it will typically need at least a 100 liter / 20-gallon aquarium to do well. They are usually sold when quite young and will, therefore, grow larger and larger as they mature. A fully grown Clown Loach will need a 540 liter / 125-gallon aquarium or larger. Wild Clown Loaches inhabit densely grown waters in Indonesia and will, therefore, appreciate a planted aquarium or an aquarium with plenty of rocks and caves which the Clown Loach can hide among. A combination of both plants and caves are ideal. Adult Clown Loaches like to nibble on plants and you should therefore ideally choose tough and fast-growing plants like Java Fern and Anubias. Juvenile Clown Loaches can usually be kept with all types of plants as long as they appreciate the same water conditions as the fish. The Clown Loach loves to squeeze itself into caves, rock formations and other tiny places that can barely fit it. To put it simply: the more decorations the better. The aquarium must be decorated when you bring your Clown Loach home from the fish store since it is most likely quite stressed from the long journey from Indonesia. A majority of the Clown Loaches available in the aquarium trade is caught in the waters of Sumatra and Borneo. If you place your Clown Loach in a barren aquarium, it will not have a chance to recuperate. It will instead become more and more stressed. Stressed Clown Loaches are very susceptible to a parasite called Ich (White Spot Disease). Don't be afraid if you notice that your Clown Loach has squeezed itself behind a piece of aquarium equipment, chances are that it is not at all stuck, it just likes to feel safe. The Clown Loach is also found by digging itself into tiny places. It is therefore important to use a substrate without any sharp edges in the aquarium. In the substrate, you can place a wide range of different things for your Clown Loach to explore and hide among. You do not have to limit your self to plants and rocks; PVC pipes, flower pots, roots and ceramic and plastic aquarium ornaments will also be highly appreciated. It is important that the decorations have no sharp edges since the Clown Loach will like to squeeze itself into the smallest places possible. If you place floating plants in the water they will dim the light and make your Clown Loach less shy and more active during the day. Vigorous filtration is necessary since Clown Loaches are sensitive to poor water conditions. A combination of mechanical, chemical and biological filtration is recommended. Change 25 percent of the water at least once a week. Smaller and more frequent water changes are even better. 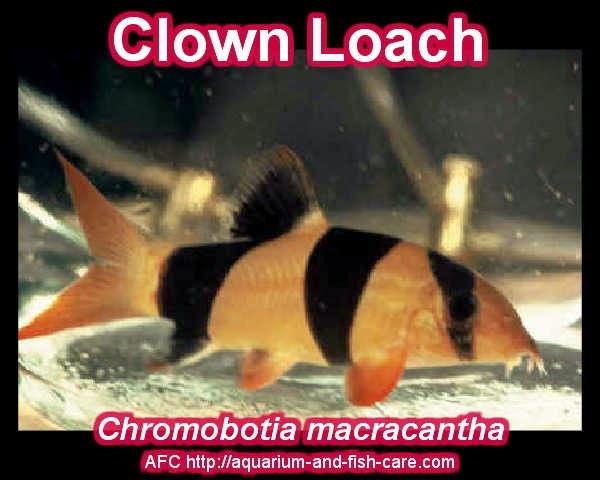 Even a slight disturbance in the water quality can harm you Clown Loach and in a community aquarium, the Clown Loach is usually the first fish that fall ill or die when the water quality drops. Since you will find the live Clown Loaches in streams and rivers, the aquarium should ideally also have strong water circulation. The aquarium must have a well-fitted lid since Clown Loaches are vigorous jumpers. The kuhli loach or Pangio kuhli or Acanthophthalmus kuhli are members of the family Cobitidae. They are native to Indonesia. They can be found in Singapore, Malaysia, Borneo, and Java. Kuhli loaches have elongated eel-like, scale-less bodies. They commonly have alternating light and dark color bands circling the length of their bodies. The combination of shape and color bands make them resemble a snake more than a fish. They slither along the bottom of an aquarium much like a snake or an eel would. They are definitely one of the more interesting additions you can make to your aquarium. The Kuhli loach is a bottom dwelling scavenger fish. Scavenger fish can always be distinguished from other fish by their downward facing mouth with the protruding barbles on either side. Barbles are a tentacle-like organ that contains taste buds. They serve the dual purpose of helping the scavenger find food and to help him feel his way along the bottom of a riverbed in murky water or at night. Kuhli loaches are nocturnal. They scavenge at night and spend most of their day hiding under plants and rocks. They are also borrowers. They often burrow into the substrate to hide or rest. Sand works best if you are planning on raising kuhli loaches. You definitely want rounded gravel if sand for some reason is not an option. Sharp edges can damage their barbels. If you use a gravel siphon to help keep your tank clean remember that kuhli are burrowers. Take a head count. You don't want to injure one. Kuhli loaches, like all bottom dwellers, make a wise addition to a community tank. Scavengers are mild mannered. And they help keep uneaten food particles from creating harmful bacteriological build up in the water. Kuhlis take readily to heavily planted tanks and have an affinity toward aquarium decorations with openings. They seem to take comfort in knowing there is a cave to retreat to. It also makes a great place for them to hang out in during the day. Kuhlis are highly social creatures. They like to congregate with members of their own species. Purchasing a single Kuhli for your tank would not only be an injustice to the animal, it would also deprive you as an aquarium owner the pleasure of watching them function as a group. Kuhlis are rather tolerant of their surrounding. They prefer slightly acidic water (pH 6.7-7.0) with a temperature range between 75-86°F. Kuhlis grow to 3-4 inches as adults and can live up to 10 years. Females have fuller bodies than the males. Kuhlis are omnivores. They should be fed at night with the aquarium lights off. Sinking wafers or heavier food matter will ensure they get plenty to eat. The Kuhli is egg layers. But they rarely take spawning in captivity. No one seems to know what conditions are most likely to induce a kuhli to spawn. Having a group of kuhli with an abundance of hiding places tends to help them feel comfortable enough with their surroundings to reproduce. Kuhli loaches have been reported to breed underneath under gravel filters. The clown loach has many unique characteristics starting with their morphology. They have a spine underneath each eye that becomes erect when they are stressed in some way. They can use it to defend themselves or attack other fish, which only happens in one instance as far as I know because the clown loaches are very peaceful normally. When you have multiple clown loaches that are added to an aquarium they may squabble in order to figure out who is going to be the Alpha, the top dog as it were. In these fights the sub ocular spines are erect and some fish may sustain permanent scars or other minor damage. When a clown loach is caught for transport they will generally erect their sub ocular spine. At this point you have to be careful that you're not stabbed with the spine when handling the fish. Also, if you're using a net the spine can easily get caught and possibly cause major injury to the clown loach. Another consideration of the spine is that if you put the clown in a bag for transport they may rupture the bag with their spine. So you're better off double or triple bagging them, or even better still would be to transport them in a solid container. You may also see the spine erect when the clown is sharing a tank with more aggressive species of fish. The docile clown loaches scare easily so it's recommended that you have other peaceful species for them to share an aquarium with. Sometimes the spine can remain erect for more than 12 hours after an encounter, eventually it will go back to resting position. Something you may notice when taking a careful look at a clown loach is that they don't appear to have any scales. Don't believe everything you see though. They do have very small and faint scales on their body, but none on their heads. They also don't have any skin covering their eyes. Another curious thing that you will notice is the clicking sound clown loaches make when they're eating or squabbling. It can get quite loud, so loud in fact that you might be fooled into thinking that the aquarium has cracked. They make the clicking sound by grinding their pharyngeal teeth. Imagine if you were sitting beside a river bed in Borneo (where clown loaches live) and you begin to hear them clicking; thousands of them clicking. I think it must get just as loud as many frogs on a pond, but I digress. During the late spring you may notice some strange behaviour from your loaches at dinner time. Well, you can always expect strange behaviour from them, but this behaviour only happens once a year for a short period of time or it may not happen at all. Some aquarists find that their clown loaches have 'feeding frenzies' in the late spring. They all attack the food as though they haven't been feed in weeks. I speculate that they do this because of something in their natural habitat. It could be a time when food is scarce for them in nature or maybe they need to get as much food as they can for the breeding season. For the sake of keeping this article short I have limited the unique attributes to only a few, but if you have a clown loach you know there are many more. The Kuhli Loach, Pangio kuhlii, is a small eel like fish. It comes from Indonesia, Malaysia and Thailand. Other names include Coolie Loach, which is a clear miss-spelling of Kuhli; both these words are pronounced in the same way. It is also called "Prickle Eye" because it has a prickle near its eye. This prickle probably gives this fish some protection from predators. The Kuhli loach will supposedly grow up to 12 centimetres (4 and a half inches) long, but I have never seen one this big. Most of the ones available are much smaller than this. One of the reasons for this variation is that there are several subspecies of Pangio kuhlii, and the size they grow to varies a lot. They have been reported as living up to 10 years. The Kuhli Loach is an equatorial fish; the main areas it is from are a little to the south of the Equator. It needs warm water, and a temperature of between 24 and 30 degrees C (between 75 and 86 degrees F) is suitable. They can survive a slightly higher or lower temperature than this range, but I do not recommend it. In the wild this fish is mainly found in slowly flowing streams with a sandy bottom with a layer of organic matter from the surrounding forests in many places on the stream bed. The water in these streams tends to have a fairly low mineral content and to be soft and acidic. There are plants growing in sections of these streams. In an aquarium they will adapt to a moderate hardness and can certainly take a hardness of up to 10 dH. A pH of up to 7.5 is generally tolerated. The water needs to be reasonably clean in the sense of not having a large build up of fish wastes. In an aquarium you should avoid any sharp substrates and fine river sand is the normal choice. I have also had success with using large (6mm or more) rounded pebbles. These fish not only search the surface of the sand for food, they will go right into it. I have seen them dive straight into the sand to avoid being caught. With larger pebbles they will go between the pebbles looking for food. These fish seem to like densely planted aquariums. Including some floating plants is also a good idea. Kuhli loaches are omnivores with a requirement for some animal based food. They will certainly eat flakes and pellets. One of their favourite foods is frozen bloodworms. They also like frozen brine shrimp. This is a bottom feeding fish, so it is necessary for some of the food to reach the bottom. Although the Kuhli loach in not a schooling fish in the normal sense, they seem to need company. A single Kuhli may be able to, live all right in a tank, but will tend to be hidden nearly all the time during the day. A group of perhaps eight of these interesting fish will behave quite differently and are much more likely to come out and show themselves during the day. This is a small peaceful fish, and is a suitable inhabitant for a community aquarium of small peaceful fish. Steve Challis has many other fish fact sheets and other articles on http://www.bettatrading.com.au including one about keeping and breeding the Black Kuhli loach which is a near relative of the Kuhli Loach. That article is at http://www.bettatrading.com.au/Black-Kuhli-Loach-Fact-Sheet.php.